Today's card is one that we made at last Saturday's stamp-a-stack. I chose several cards I received as trades at Leadership and tweaked them in some way. In this case, I changed the color combination and added the ribbon, other wise the layout is the same. The original swap is from Brenda Stayner - I didn't get a chance to get a picture of her card, but if I get time today, I will take a quick pic and add it to this post. 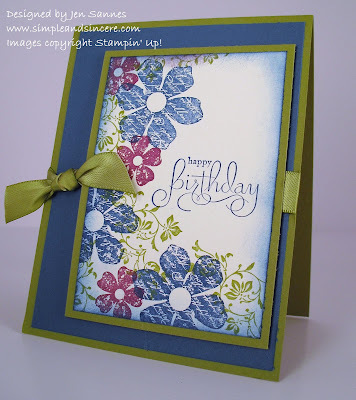 This seemed to be everyone's favorite card from Saturday's class, and I have to admit that it was my favorite, too. I am in love with the colors (Old Olive, Not Quite Navy, Rich Razzleberry) - it could work for guys and gals alike! And I noticed that several of my customers ordered the Vintage Vogue set - I think this is one of the most popular sets from the Occasions Mini. I am so glad I received it at the Phoenix Regional! I missed wishing you a Happy Birthday yesterday. Hope you had a great day. I love checking out your blog. Your cards are wonderful.